138 pages, 8 x 11 inches, softcover $19.95 Hardcover out of print. The Green River Valley has a story to tell…. 138 pages, 8 x 11 inches, Soft Cover $19.95, Hardcover out of print. In 1824, a group of fur trappers crossed South Pass, in what is now western Wyoming. They entered the beaver-rich valley of the Green River and kicked off the Rocky Mountain Fur Trade. Little did they know, they would also create America’s first far western hero, the Mountain Man. For 16 years, the Green River Valley served as the center of the mountain fur trade, supplying prime beaver pelts as well as hosting a majority of the renowned annual rendezvous. On this stage, some of the most colorful events in the early history of the American West took place. 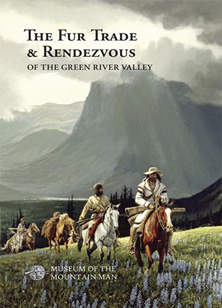 This book introduces the history of the fur trade and the cast of characters who plied the unpredictable and sometimes fatal business in Wyoming’s Green River Valley until 1840. Meet the spirited individuals from all walks of life who were willing to risk all they had, every day, for a chance to gain wealth, power and adventure through the harvest of skins.